How long have you been working at IE? What are your future goals professionally? I actually want to be a doctor so probably next year I will be going to the school of medicine for pediatrics. That is why I am working so much because I want to save money to start school next September. How is working at IE helping you towards your goals? Impact has really helped me. Now I have goals, I know I want to go to school. I have targets every month. I have to raise money for school so I have targets to meet to make that money. I know I have to make a certain amount of calls in order to make that goal. What was your most memorable experience at IE? I think most memorable was the first time I was awarded Employee of the Month. They were able to recognize my efforts. It was really memorable for me because I love my job, so I appreciated being recognized. I love singing, I do a lot of signing. I also love cooking. I like playing basketball. I like sports so at least once a week I try to play basketball outside of work. Social Impact Measurement: What are the Tools? Recently, we looked at how social enterprises are establishing a model for future industries. By blending social awareness into traditional business practices, companies gain various benefits that lead to long-term results. At first glance, this may seem obvious and optimistic, but how do we actually measure the social impact? Measuring the social impact of these organizations can be difficult, but the Global Impact Investing Network (GIIN) is attempting to standardize impact research and measurement through their Impact Reporting and Investment Standard (IRIS). The IRIS catalog is designed to work across sectors and applies to various measures of performance including financial, operational, product, sector, social and environmental objectives. By utilizing standardized impact measurement tools, new investors are able to fairly compare potential investments based on quantifiable data. Social investment fund managers are able to track the performance of their funds with ease. The social entrepreneur is more easily able to track the impact of their company and demonstrate its scalability. Finally, the general public will have a more transparent view of the social enterprise. From the data gathered so far, this model of sustainability seems to be working. According to the recent GIIN Impact Investing Benchmark Report, social investment funds formed between 1998 and 2004 have outperformed comparative conventional private investment funds. Social investment funds were also more likely to weather the 2008 financial crisis. More recently launched impact funds trail their peers, but this is in large part due to the longer investment horizon for impact investors. Overall, the study finds social impact funds are performing mostly in line with conventional peers. These figures demonstrate that being socially minded can have high returns on investment for all involved. From personal experience, being socially minded has benefited us at Impact Enterprises as well. We realize our mission of creating valuable employment in Zambia by providing not just jobs but professional development for our employees. Internally, this results in more dedicated employees and higher overall satisfaction. For our clients, they know that they are offshoring their work in a socially conscious manner. This means we are able to stay competitive even against more established peers. The question ahead is, what will happen to social enterprises as they grow? As more players become involved in the sector, how will that tip the balance of supporting stakeholders versus satisfying shareholders? For example, in April 2015, Etsy, a certified B-Corp, went public, being only the second company to do so. As a publicly traded company, they will be particularly responsible to their shareholders who have the right to dictate the course of the business. Public companies are often criticized for focusing on short-term profits over long term economic sustainability. Can these companies that are accountable to profit minded parties – be it the investment funds or shareholders – find the right model of maintaining their social impact? Probably by the end of this year I will be back to school. I want do my degree in Environmental Education. I want to specify in environmental health. First let me say, I’ve learned a lot from Impact in terms of how to be a professional. I’ve realized how to conduct myself. As well, I’ve learned a lot on socialization. When I was given a new project. I was excited and I was nervous because that was my first time being in charge of a project. I didn’t want to fail on the project, but I got to gain some experience relating to my colleagues and working with management. I’ve also learned to take responsibility for all the work that I do. What are you passionate about?/ What are your hobbies? The reason why I want to study is because of how the environment is being managed and I want to do more to increase my impact and help others learn how to understand the issues of the environment. On October 6, 2015, our CEO, Dimitri Zakharov, was a keynote speaker at the UNCTAD conference on ‘Global e-Commerce – Breaking Barriers to Inclusivity’ in Cambridge, UK. The conference presents key findings from the UN’s annual Information Economy Report. 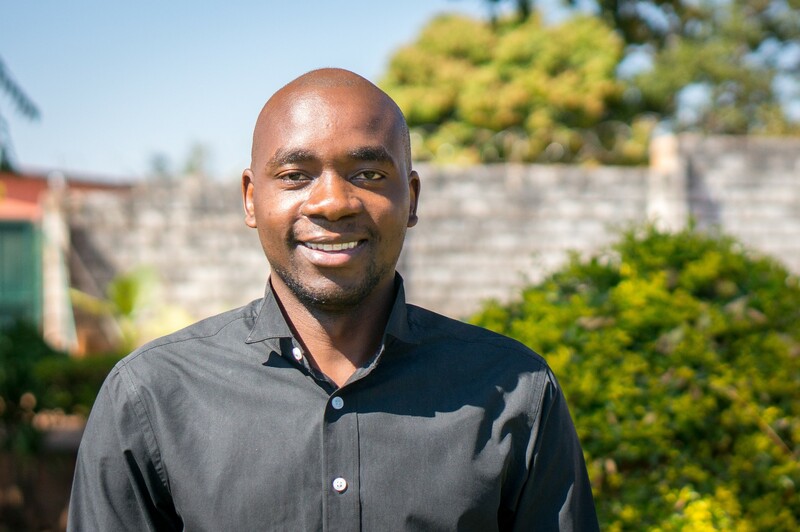 Impact Enterprises was proud to present its work in Zambia as a shining of example of how e-services are expanding into Africa and presenting new employment opportunities for a generation of underserved youth. Below is a transcript of the speech. I want to thank the UNCTAD and Torbjorn Frederikson for inviting me to speak to you all today. It’s a pleasure to be here not just to represent our company, Impact Enterprises, but also Zambia, and its emerging tech sector, and Africa as a whole. I want to discuss with you today the emerging digital service sector in Africa and from our perspective, the success and challenges faced. 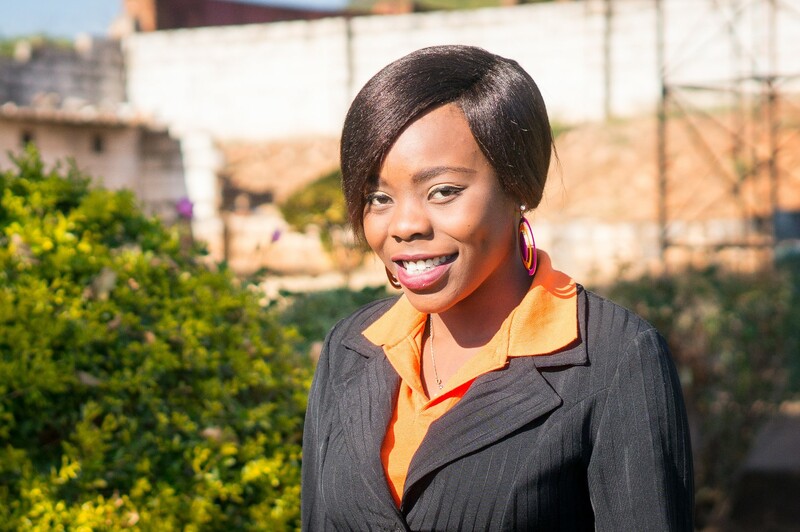 To give some background, Impact Enterprises is the first socially conscious outsourcing company in Zambia. We provide personalized, cost-effective support services such as lead generation, content moderation, and order management for dynamic, growing companies and organizations. We operate in an emerging sector called “impact sourcing.” This is the subsector of the broader business process outsourcing, or BPO, industry that brings sustainable employment to underserved communities. Today, it accounts for 12% of the overall $104B BPO industry and is growing 11% per year. This has been happening in India, where companies are now moving away from the tech cities like Bangalore into Tier 2 or 3 rural locations. This is happening in Central and Southeast Asia. And of course, in Africa, where youth employment stands at 51%. Our company, Impact Enterprises, launched in 2013 in Eastern Zambia. Zambia is a southern Africa country of about 14 million people where unemployment for 20-24 year olds is at 59%. Those who can’t find work often go into the informal economy, the majority being agriculture. To give you some statistics, for 57% of our employees, working at Impact Enterprises is their first formal job. Just over half of our employees are female. And 83% of our employees now support on average 3.5 other people. They’ve already become leaders in their families and communities. Bringing the service sector to Africa isn’t just a social cause. It’s become an economic necessity. Like many African countries, Zambia is a commodity based economy. 70% of its exports are from copper mining, a large amount being demanded by China. The problem is, copper is now at a 6 year low and downturn in China has attenuated the Zambia economy. What Zambia, and many countries, must do is diversify and this is where technology services can help. Like the manufacturing industry, technology services allows for expansion in worker productivity, with the added benefit of requiring relatively little investment to achieve economies of scale. This is why we’re seeing Africa becoming the next destination for outsourcing. From a business case, impact sourcing is proving a better value overall. 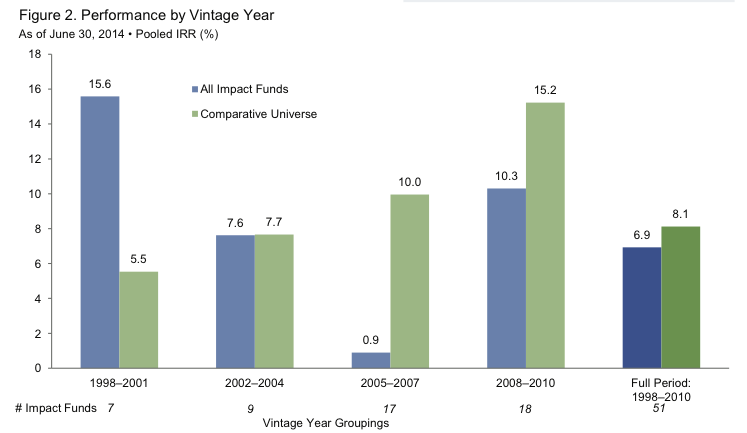 Compared to even traditional BPO services, impact sourcing has demonstrated added value of 4-6% in South Africa, 10-15% in Kenya. And for our clients, we’re providing cost savings of as much as 50%. Impact sourcing also provides a new pool of talent that’s familiar with the domestic market. Africa already has the youngest population in the world and will have the fastest growing economy in the next 5 years. This is increasing demand for local expertise. It also is showing lower attrition rates among employees compared to traditional outsourcing, between 15-40%. This means employees stay longer, gain specialization in their service, and provide superior support. So why is this so difficult to implement? Why can’t we just give everyone a computer and internet hookup and they start competing for jobs? Rather than look at the macroeconomic issues, I want to look at this from a different perspective. I want to discuss the evolution of the workplace and how that presents a barrier to entry for a new workforce. Over the course of our human civilization, the workplace has evolved through 3 major phases. In the first phase, for thousands of years, people worked as individuals. 80-90% of the world’s population was farmers. Work was incredibly unstable and offered no protections. And we still see this in places like rural Africa, where women are growing and selling the exact same vegetables as everyone else for a living. Eventually, the second phase emerged, which is the idea of the company. This really took hold after the Industrial Revolution and was a drastic shift. Now we began working in teams and hierarchy emerged. More importantly, we had stable, predictable jobs and the corporation protected the individual. We started being able to choose our careers and the idea of work/life balance emerged. Now, in developed countries, we’re seeing the third phase emerge. This is the time of the freelancer. Thanks to technology, the individual can take on an entire company in a David vs Goliath fashion – think of Uber. We are seeing very horizontal and flexible companies that are blending our work life and personal life. This third phase is how many of us here are starting to think. But this poses a problem. What we often see in social agendas that try to address the issue of unemployment in developing countries is trying to deploy a Phase 3 type model without having the population adopt the principles of working in a Phase 2 company. For instance, a model of using cell phones to perform microwork in rural locations. To illustrate this problem, at Impact Enterprises, at the end of last year we conducted our first bi-annual survey. One of the questions we asked our employees was, “What skills have you gained from your employment here?” And the response we got was a complete surprise. This is an incredibly important finding that shows the implication of bringing digital services to a place like Africa. In Zambia, where most people still have a deep connection to the village that still operates in the Phase 1 individual mentality, we can’t overlook the step of adopting the responsibilities of teamwork. That’s not to say that there aren’t brilliant individuals who can dive into the Phase 3 marketplace and succeed, but this isn’t a scalable approach. For a sustainable service sector to exist, it requires a deep investment in individuals. We’re talking about more than just digital literacy. We’re talking about shaping the mindset of the future of work. Last week, as many of you know, the UN adopted the Sustainable Development Goals as the successor to the Millennium Development Goals. On the flight over here, I reread the new SDGs and took note of the last one – number 17. What we’ve seen change over the last 20 years is a move from a sole reliance on the public sector for change, to a stronger partnership with the private sector. If you go to South Africa today, what you will see is a rich, mutual dialogue that’s happening between different stakeholders. There’s corporations that are working directly with universities and training facilities to shape the curriculum. The government is talking with companies to shape policy to meet global demand. Multinational organizations are raising awareness with customers on the benefits of impact sourcing. In Zambia, this dialogue is only just now emerging and is requiring the private sector to step up to the challenge. At Impact Enterprises, we’ve taken on the role of multiple stakeholders to prepare our workforce for the responsibilities they take on. This year, in 2015, we’ve launched an ongoing curriculum of workshops that address the soft skills necessary for the workplace, such as professionalism, teamwork, and problem solving. We bring in guest speakers to talk about their careers. Here our employees are doing the “marshmallow challenge” which is a creative thinking exercise. We’re particularly proud of the weekly women’s group we’ve started that allows the female employees at Impact to get together and support each other in their lives. They discuss career advice, self-esteem, gender equality, and in general how to be a better person. What the impact sourcing sector is doing is opening new possibilities, both for the communities we’re impacting locally as well as the market opportunities we’re creating globally. It’s asking, who are we missing? How far can we go? So I want to close out not with my words, but with one of our employees. The other month, we featured our women’s group on our company blog and we asked for them to contribute, and loved this quote from Debra. She’s the one right in the middle in the white dress. Debra started with us in May of this year and has been with us for the last 5 months. 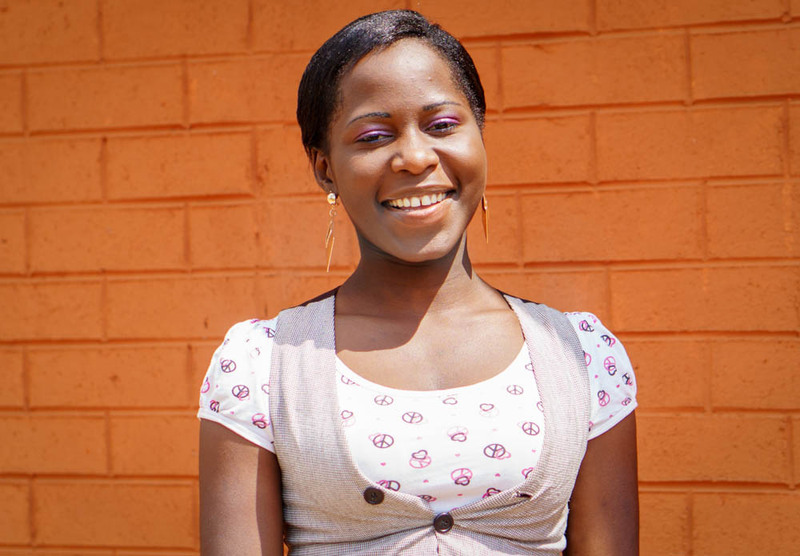 “Being at Impact Enterprises means a lot to me. With a dream of becoming a midwife vigorously bubbling in my spirit, it has helped in numerous ways to reestablish my self-esteem and confidence as a woman. Thank you Debra. Thank you to the whole Impact team. And thank you all today. Social enterprises are on the rise and they’re demonstrating a new way of doing business. Emerging from the innovations of decades of social initiatives, they are now reshaping companies in ways not thought possible. And there’s much we can all learn from their example. The social enterprise movement isn’t just a small niche focused on causes in the developing world. Estimates suggest that there are 62,000 social enterprises in the United Kingdom with revenue of £24 billion. In the United States a recent survey suggested that social enterprises could potentially account for up to $500 billion in revenue. This industry is blurring the lines between for-profit businesses and the non-profit sector. On one side are non-profits (or the more aptly described not-for-profits), organizations that use their proceeds for the benefit of a social problem. On the other are for-profit companies that direct their earned profits to the owners, such as the partners or shareholders. For-profit companies can still be involved in social missions, but today this is largely in the form of corporate social responsibility (CSR) and philanthropy arms. These programs are typically an appurtenance to the primary service of the business where consumer and shareholders’ interests are at stake. 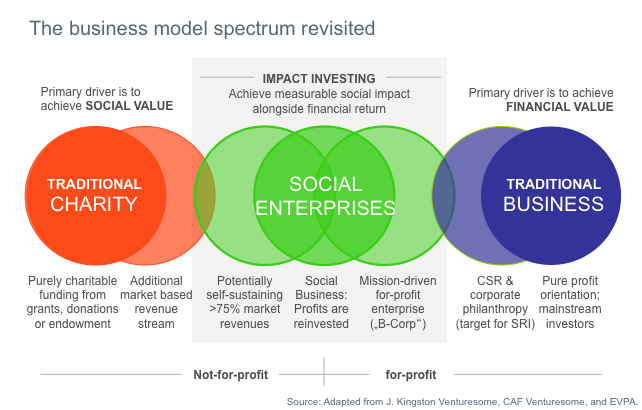 Social enterprises fit somewhere in the middle of the business spectrum. Jonathan Greenblatt, Director of the Office of Social Innovation and Civic Participation in the U.S. Domestic Policy Council, describes a social entrepreneur as someone who creates change through a market based approach using direction action. Rather than trying to change the market environment through say lobbying or policy changes, they come up with solutions using a business model. Take for example VisionSpring, which trains local entrepreneurs to check eyesight and sell eyeglasses. Their model tackles both unemployment and healthcare needs. Or Ethos Water, now a Starbucks subsidiary, which donates a portion of revenues towards water and sanitation initiatives. The recent growth in popularity and size of socially-conscious companies is reshaping markets around the world. Consumers in particular are demanding more from their products. The sophistication of Millennials, driven by information ubiquity, is putting pressure on companies to connect consumption to cause. Today, companies are reviewing their entire supply chain, including the labor, materials, transport, and logistics of operations. They are being more transparent with the allocation of their profits. Third parties are able to attest to a company’s social impact, such as the B-Corp certification or the Impact Reporting and Investment Standard (IRIS). In the past, companies would eschew social causes, seeing them as a cost or logistical burden. Today, social enterprises are proving that adopting a socially-conscious business model has many benefits. 90 percent of shoppers worldwide are likely to switch to brands that support a good cause, given similar price and quality. These consumers are also having deeper, richer conversations with companies. When a brand stands behind a vision, they can connect with consumers on a whole new level. On the bottom line, companies can gain cost savings and long term sustainability. For example, reducing the amount of packaging required for shipping can immediately reduce costs but also ensure companies don’t need to reconfigure supply chains in the future. Even internally, a company benefits from adopting a social enterprise model. Employees become motivated by a higher purpose in their companies. They also strive for higher innovation, to ensure their products are sustainable and socially conscious. Moreover, as Millennials become a more dominate part of the workforce, corporate culture will need to change. A study by Brookings Institute states that two-thirds of Millennial employees said they wanted their employers to contribute to solving social problems, compared to only half of Baby Boomers and Generation Xers. On the grander scale, it behooves all companies to adopt some mix of social awareness. Pressing issues like global warming, deforestation, food security, and human rights abuses can only be overcome by integrating social entrepreneurship into the market. Today’s social enterprises will hopefully be seen as pioneers for tomorrow’s new industries. How long have you been working at Impact Enterprises? I’ve been here for about 2 years now. What IT skills did you learn here at Impact Enterprises? I was taught how to improve online research, for instance how to research business through websites such as LinkedIn etc. I am planning to go to school next year and to study pharmacology. I have already applied and I am waiting for a response. How is working at Impact Enterprise helping you towards your goals? It helped me to learn how to be responsible, how to keep time, to have discipline. The feeling of having some responsibilities keeps me going. Now I know, wherever I go, I have to work hard. What was your most memorable experience at Impact Enterprises? I had a great time on the leadership training to one of the hotels nearby. I required a lot of knowledge there. It went on for 5 weeks and on the final day, us, the leaders, we were holding a workshop.